Camden Midtown features one and two bedroom apartments in the heart of the Midtown neighborhood in Houston, TX. We even have Houston Midtown Townhomes available! This garden-style community offers a one-of-a-kind living experience with lush landscaping and abundant green space, right in the middle of the city. Forget about the midrise concrete jungle, and escape to a peaceful garden-style setting complete with beautiful courtyards. You’ll love living in the most walkable district in Houston; only steps away from the METRORail, Downtown, and over 140 restaurants, bars and coffee shops in Midtown. A few of our favorite pedestrian destinations include Randalls Grocery Store, Irish Cowboy, and Ibiza Food & Wine Bar. View our available apartments and find a deal that can't be beat. 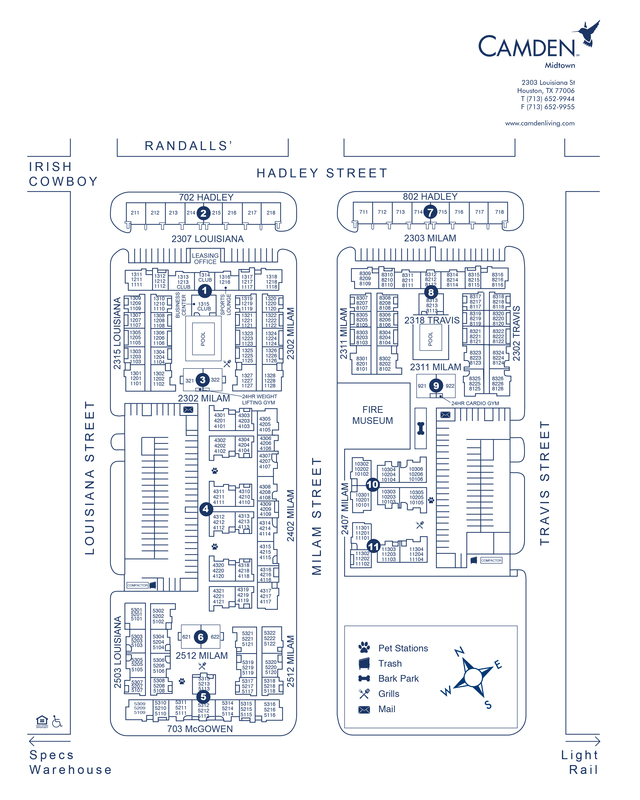 For those who enjoy an active lifestyle, Camden Midtown offers a variety of amenities. We have two 24-hour fitness centers, two beach-style pools, and a rentable resident room - a lounge perfect for friendly competition or catching your favorite game on TV. Start planning your full-body workouts now! Check out a virtual tour of one of the fitness centers here. Our pet-friendly community also features a private dog park with an agility course. Need to get some work done? Our business center is open 24 hours and the nearby coffee bar will ensure you finish the job! Camden Midtown also features several outdoor grills with dining areas just waiting for you to host family and friends. But, don't take our word for it; read the Camden Midtown highlights on Apartminty. Each apartment features spacious kitchens with stainless or black appliances, wood-style flooring, and granite countertops, as well as full-size washers and dryers. Relax on your own private patio in the center of everything Houston has to offer. Enjoy conveniences like covered and direct access parking, at-your-door trash pick-up and recycling, as well as onsite dry cleaning services. We are also currently transitioning our community to be non-smoking. Read more about Camden Midtown in Apartminty's Midtown Neighborhood Guide. Looking for privacy in the heart of Midtown? Our townhomes are the closest you can get to home living with all the conveniences of an apartment. Each townhome features two bedrooms, two bathrooms and a study with an attached garage. Enjoy open concept living with huge windows letting in beautiful natural light, modern finishes and luxury details. Residents receive a technology package included in the total monthly rent with a savings of up to 55% off retail. This money-saving package includes high-speed internet up to 150 Mbps and over 140 digital video channels, 80 HD channels, and the full multiplex of HBO through Xfinity. Use the Xfinity Go app on your smartphone or tablet to access your digital video anywhere! Named one of the top 5 Houston apartment communities with the best customer service, our community can't be beat. At Camden Midtown, you can have it all. We'll save a spot for you! All residents can park in our direct access parking garage and some apartment homes have attached garages. We offer one parking permit per lease holder. Visitor parking is located on the top level of the garages, just follow the visitor parking signs! All guests must display a valid visitor parking permit obtained from the resident they are visiting.